We offer both our residential and commercial inspection clients a full range of Exterior Insulated Finish Systems (EIFS) and Stucco Inspections. We are Certified by the Exterior Design Institute (EDI) as Third Party EIFS Inspectors. Exterior Design Institute is a non-profit organization that trains and certifies inspectors to raise the quality of EIFS inspections in the construction industry. EIFS stands for Exterior Insulated Finish Systems. It is also known as synthetic Stucco. EIFS first was imported to the United States in the late 60’s. Lately there has been a lot of excitement over this system and its documented failure as a siding system. There have been many reasons given for this failure, but almost everything can be traced back to faulty installation. 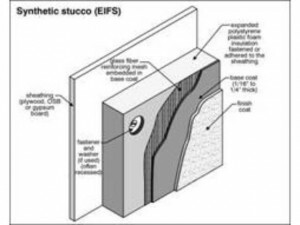 What is the difference between EIFS and Stucco? EIFS come in several different types. But the typical installation includes the substrate, polystyrene foam board fastened or glued to the substrate, fiberglass reinforcement mesh, base coat (usually 1/16 to 1/4 inches thick and then a finish coast. Stucco on the other hand is plaster Portland cement. 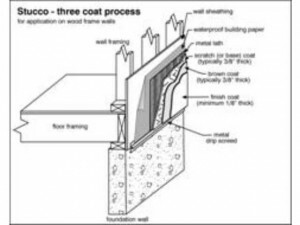 The Stucco assembly usually includes a substrate over the framing members (there is an open framing system) with a moisture barrier present, self furring lath, plaster cement basecoat and finally the hard coat finish. Both systems have their advantages and disadvantages. However, it is the EIFS that has had the most problems. Read further about EIFS and its problems below. The simple answer is “Yes”. EIFS has problems just about any place that it has been used in home construction in the United States. The problem is improper installation and lack of proper detailing and sealing the EIFS. Most applicators either do not care or do not know the proper procedure for applying EIFS. 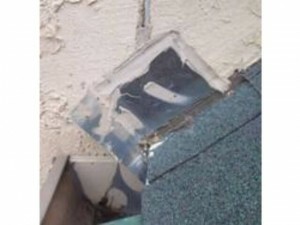 This leads to failure in a very short time and water intrusion. If problems are identified and remedied quickly, damage and cost’s can usually be limited. 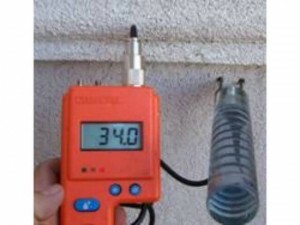 A thorough and complete inspection and testing is very important in identifying areas of moisture intrusion. Well, like many other things your builder told you, he’s stretching the truth on this also. We have found even new homes with the same old moisture related problems, all because of improper installation. There are very few signs. This is why inspection and testing is so important. Some of the signs you may want to look for is bulging EIFS, water stains on the outside or inside of the wall at and around the windows. The answer is usually “Yes” if you know what you are looking for. Probe holes are about the size of a pencil lead (1/8 inch). The amount of holes needed is determined by where we find moisture and how large of area we find moisture in. After we are done testing, sealant is used to fill and seal the holes. Usually after we are done, people cannot find our holes unless they know the exact spot to look. The cost varies from home to home depending upon the square footage of the home, how much EIFS there is on the home and the extent and complexity of the EIFS. The average EIFS inspection runs $350 to $700. The cost of our inspections are a real bargain when realizing that replacing the EIFS and wall structure of a home may run into the tens of thousands of dollars if the moisture intrusion is ignored. Which would you rather have, a $600 report detailing the moisture intrusion that gives you the information to get repairs initiated or a $200 report that tells you little or nothing about your system? Unlike many other so-called EIFS inspectors in the area, we do not make repairs ourselves and we are not affiliated with any repair companies. These type of inspectors can overstate problems with your EIFS so that the repair bill can be inflated. Our clients that have used our inspection services on their non-EIFS homes know how thorough and professional we are. We bring that same type of professionalism and thoroughness into the EIFS field also. If you’re serious about finding out if you have moisture problems, contact us or give us a call at (972) 572-4500 today and we will be happy to discuss your home or property with you.